What are the best ways to warm up breast milk for your baby? As a mother, you want your baby to always be fed on time. 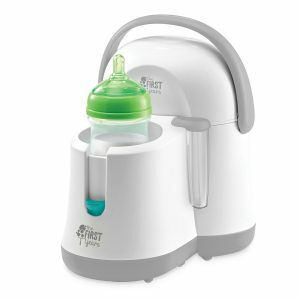 One of the best ways to make sure your baby always get her own share of fresh breast milk is to keep it in the special bottles that usually come in the package with the breast pump you use. But, what are the best ways to warm up that packed breast milk for your child? First, it is a good idea to put in the refrigerator the exact amount of frozen breast milk you expect to use the next day. Thawing frozen milk in the fridge will shorten warming time, thus avoiding an extended period of time with a hungry, impatient, and crying baby. Later, you can warm thawed milk by holding the bottle under warm running water to quickly thaw. Never use hot water to thaw milk, luke warm will be better. You can also place the sealed container in a bowl of warm water for 20 minutes to bring it to body temperature. If you did not pre-thaw the frozen milk in the refrigerator, you can use these same way, but also, avoid them temptation to use hot water to warm up milk. The best way to warming breast milk while preserving all of its nutritional value is to never overheat it. You should heat breast milk to approximately at or a bit below body temperature (which is 98.6 F / 37 C). Using only warm water bath temperatures to heat up milk will avoid the loss of nutrients and the risk of overheating. Do not let the level of water in the bowl or from the tap touch the mouth of the container. You should never refreeze your breast milk. Thawed milk is safe in the refrigerator for only 24 hours. Always use your oldest milk first. Your baby may drink milk cool, at room temperature, or a bit warmed. Never use a microwave oven or stovetop to heat breast milk, as these may cause scald spots and will destroy antibodies. A microwave may also destroy valuable nutrients and vitamins in breast milk. Swirl the container of milk to mix the cream back in, and distribute the heat evenly. Do not stir. If there is some milk left in a container after a feeding, you should discard it and not use it again. The Kiinde Kozii Bottle Warmer and Breast Milk Warmer allows you to safely and quickly warm your breast milk, formula, and food in storage bags, bottles, or jars of all shapes, sizes and materials. This is the first and only warmer designed specifically to follow all guidelines set forth by the CDC (Centers for Disease Control) and the USDA (United States Department of Agriculture) to safely thaw and warm breast milk using warm, flowing water. Patent pending SAFEHeat technology allows high-speed warming using a low temperature, nutrient-safe water bath that is safe for breast milk, with a built in timer to eliminate the risk of overheating. The result is a warmer that is safer, more precise, faster and easier to use than conventional warmers which use high temperature steam that can be damaging to the antibodies and nutrients contained in breast milk. This warming chamber is designed to accommodate a full 8oz bag of frozen breast milk, and to quickly bring it to serving temperature. SAFEHeat technology promises that the contents of the warmer are brought to the same temperature every time as easily as possible. It is extremely easy to use: Simple, intuitive interface lets you know how much time is left before the meal is ready. When the time is up, the warming stops completely, eliminating the risk of overheating, even if the bottle or bag is left in the warmer for longer than intended. Pros: Heats safely, very simple to use, very nice design, automatically shuts down, worth the price. Cons: A bit slow, breaks easily- not so durable. 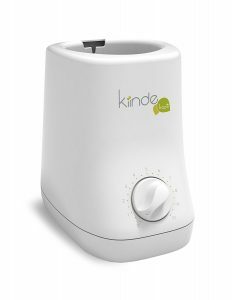 Check out the Kiinde Kozii Bottle Warmer and Breast Milk Warmer here. 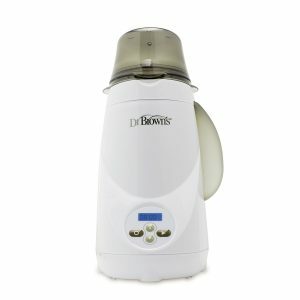 Dr. Brown’s Electric Bottle will help you warm food and milk so that your baby’s always happy and fed. It has a very spacious interior, which provides adequate space to place all kinds of your jars and bottles. The LCD panel lights up at night and sets off an alarm when the preferred temperature is reached. What’s more, the preferred time for heating can also be saved in its memory for future use so you don`t have to set it all over again. It automatically powers off after 10 minutes of no use so you don`t have to worry about forgetting to turn it off. The warmer shows a visual count down in terms of time. So you know exactly how much time you have before it is done. This breast milk warmer is very simple to use and it is very durable. Pros: Modern yet simple design, easy to use, very practical, stable, buttons are easy to press, warms up the milk very fast, the cord can be placed under the device, very reliable. Cons: Hard to clean: the water reservoir gets moldy. Check out the Brown’s Bottle Warmer here. breast milk, formula and baby food jars. It delivers bottles at the perfect temperature every time. The removable cooler conveniently keeps bottles cool for up to eight hours, and warms a chilled bottle in minutes. It has a removable cooler which can hold 2 bottles and stays cool overnight. It also has an auto shut-off feature for added safety, this way you don`t have to worry about forgetting to turn it off. It works with most bottle systems—wide, narrow, angled, even disposables. Pros: Good design, doesn`t take up too much space, very efficient, fast, easy to clean and use, fits a variety of bottle sizes. Cons: The measuring of the water is not comfortable, the price is not that affordable. The First Years Night Cravings Bottle Warmer & Cooler here. Hopefully, this answers the question: how to warm up breast milk and this article offers up some solutions to your problems.